Nature is incredibly intuitive and knowledgeable in knowing what’s suitable and supportive for our bodies throughout the year; we love that most summertime ingredients are naturally juicy and high in water as it genuinely feels like they were intended for us. As we come into prime strawberry season, we are all too quick to discard and behead the leafy greens that sit atop the juicy fruit - therefore wasting a fair amount of flesh in the process. Though no one has any desire to eat the leaves, it doesn't mean they can't serve a purpose other than satisfying our tastebuds. Here are a few of our top tips of what to do with the leafy greens, maximising the fruit and saving on waste. + Freeze your strawberry tops and use them as ice cubes in Summer punch. + Freeze your strawberry tops and add them to smoothies - the greens are just as edible as the greens you are used to. Make sure the strawberries are organic and make sure you have washed them thoroughly first. 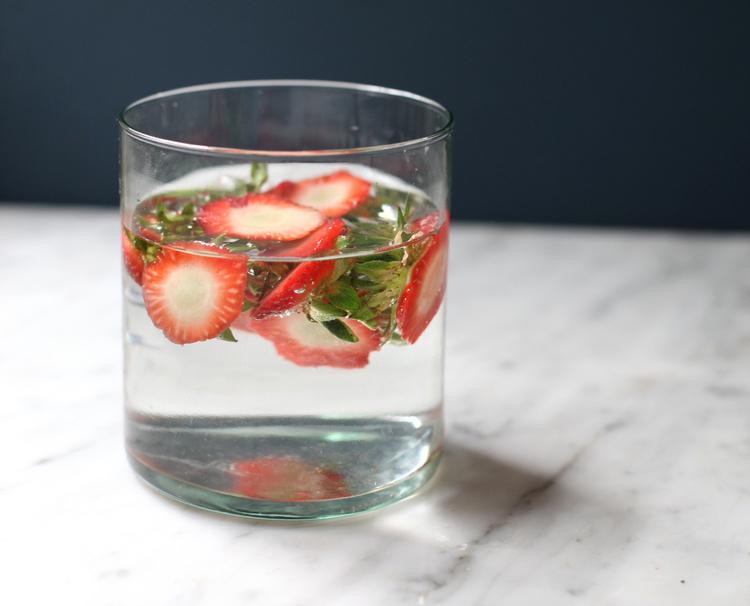 + Use your strawberry tops to infuse a glass or jug of water, or add them to your water bottle. + Making kombucha? Use the tops to flavour your homemade tonic. + Barbecue or grill your strawberry tops and enjoy them with nut butter as a warm snack. If you don't want to eat the green leaves, they will fall apart from the strawberry flesh with ease as they become more tender during the cooking process. + Mash your strawberry tops with whole berries to use if you are making Eton Mess. Make sure the strawberries are organic, and make sure you have washed them well. + Add them to soups to thicken the texture and also to add a little sweetness. This works well in tomato, carrot, sweet potato, squash, spinach or broccoli based soups. Make sure the strawberries are organic, and make sure you have washed them well.